It’s no secret that creatures are a primary resource in Magic. They are the easiest way to deal damage to your opponent and are the primary source of interaction. Can you stop your opponent’s creatures? Can they stop yours? In the past twenty years of printing dudes, Wizards has given us a remarkable range of abilities for creatures, so much so that it’s possible to craft decks that consist entirely of creatures. It’s more likely to happen in casual formats, but it’s possible even in Standard. I have two EDH decks (Animar, Soul of Elements and Adun Oakenshield) that are creature-based, and it’s time I evaluate why these are powerful strategies. There’s very few creatures that are strictly reactive. Mystic Snake and Plaxmanta are two that come to mind, but for the most part, creatures are reacted to, not reactions themselves. If they leave your creature alone you’ll gain enormous advantages just from attacking and blocking. The effect is amplified when it’s a utility creature, providing significant advantage above and beyond simply swinging in. We have a tendency in EDH and other formats to include a lot of reactive cards that will be good in certain circumstances. I personally love to have Delirium in hand, just in case someone wants to get cute with Hamletback Goliath or a Blightsteel Colossus. Unfortunately, that’s frequently a dead card in hand and you’re stuck waiting for that perfect moment. Playing a deck with a critical mass of creatures ensures that you’re never waiting pointlessly, since you’ll almost always have something you could be doing. The easiest way to get an effect over and over again is to put it on a creature. Usually it’s a tap ability, and it’ll be more powerful than an enchantment’s ability, because creatures are easier to kill than enchantments. Case in point: Arcanis the Omnipotent. Even his weaker little brother, Archivist, is good for card advantage over time. These effects don’t need to be tap abilities; they can be continuous in nature too. Ruric Thar punishes other players’ spells. Sire of Insanity is a backbreaker. Fumiko the Lowblood is a very easy way to mess with everyone else’s plans, forcing all sorts of attacks that might not be to your opponents’ advantage. Creatures, especially ones who share a tribe, are prone to having effects that synergize very well. Whenever someone asks me what their first EDH deck should be, I answer Krenko, Mob Boss. His ability is powerful and straightforward, and when you add Goblin Chieftain or another haste enabler, he gets out of hand fast! My new favorite combination is something old and something new: Hythonia the Cruel and Visara the Dreadful. They play nicely together, being point removal and a mass destruction effect together. Perhaps the best part of having an all-creature deck is adding a few noncreature spells. My Adun deck has five, one of which is the poster child for a bulk rare being so amazing in casual formats that its price just keeps creeping upward: Lurking Predators. (The other four noncreature spells? Green Sun’s Zenith, Garruk, Caller of Beasts, Domri Rade, and Xenagos, the Reveler.) With Lurking Predators in play, every one of my opponents’ spells is going to give me a creature roughly ⅔ of the time. It’s not hard to build a deck where a resolved Primal Surge wins you the game with an enormous attack. That actually gets boring. Genesis Wave is much the same way, but I’ll never fault someone who wants to go big mana, throw a Wave for 10-15 mana, and then get the Wave back with the Eternal Witness they flipped. It’s not universally true, but building a creature-based deck will often cost you less money. Chasing certain spells can add up very fast, but the utility of the creatures you add to a deck will lower the financial strain. There aren’t many creatures that get added to almost every deck, but there are plenty spells that many of decks demand. 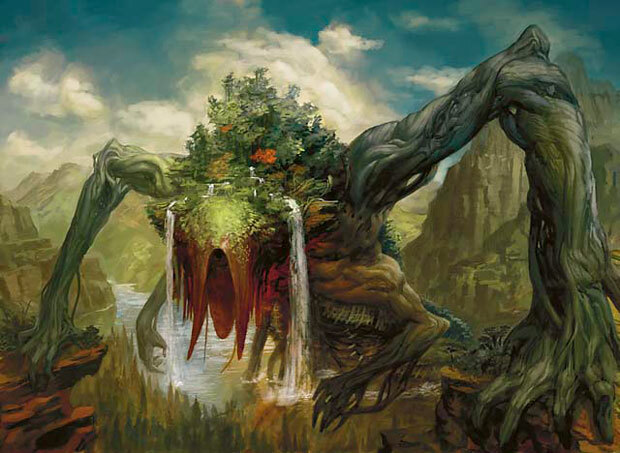 The reason why I bring up these types of casual decks is because they are a type of deck that is very frequently built in EDH, and other casual formats. This type of deck requires certain types of cards, and we can expect Wizards to continue printing cards to enable these strategies. (Hythonia the Cruel, Garruk, Caller of Beasts, etc.) Such cards will probably not demand a high price tag, as seen in Genesis Wave, Primal Surge or Dread Cacodemon. Keep this in mind as we start to move into the new year and the spoiler season for Born of the Gods. If a card is only good with a lot of creatures, that’s not a bug, that’s a design feature. This week’s tip: Shocklands. People seem to be stocked up, and rotation won’t make these dip much. I would advise you to get out if you can get around $10 in trade for any of them, unless you’re buying them at $5 and going to hold onto them for years. Their post-rotation rise will be a crawl, since RtR block was the best-selling ever which means there’s a lot of shock stock out there. 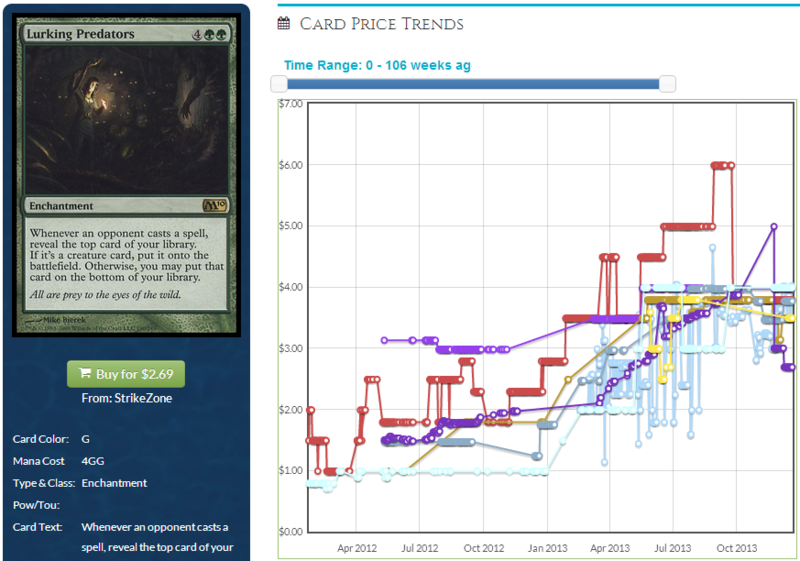 Personally, I’ve traded away more than 40 in the past month, moving into Theros cards and Modern.